David H. Park started playing the violin at the age of five in Seoul, Korea. Since coming to the United States in 1976 at the age of seven, Park has studied with some of the most distinguished artists and teachers, such as Jascha Heifetz,, Josef Gingold, Dorothy Delay, and Yuval Yaron. He received his Bachelor of Music at the University of Indiana and Master of Music at the Juilliard School. Park maintains a balance between his engagements as soloist with orchestras throughout the world and his recital and chamber music activities. Park appeared as a soloist with the Utah Symphony, the Seoul Philharmonic Orchestra, the New York Philharmonic Orchestra, the Korean Chamber Orchestra, Music Academy of the West Festival Orchestra, the Daegu Symphony, Inchon Symphony and Santa Ana Symphony. Park has given recitals in many of the world’s great concert halls including Carnegie Weill Hall and Alice Tully Hall in New York, Salle de Pleyel in Paris, and Sejong Music Center in Seoul. Park has also performed on national television and radio broadcasts in the United States, France and Korea. Furthermore, Park has participated as both soloist and chamber musician in summer festivals such as the Music Festivals of Aspen, Vienna, Music Academy of the West, Grand Teton, and Aix-en Provence, France. Some of Park’s highlights include his first return to Seoul, Korea in 1989, performing the Lalo Symphonie Espagnole with the Seoul Philharmonic. Park made his New York debut in 1994 performing Vivaldi’s Four Seasons in Carnegie Weill Hall. In 1998, Park performed both solo and chamber music in collaboration with Augustin Dumay in France which was broadcasted nationally by France Musique, the main classical radio station in France. In 2002-2003 season, Park soloed with the Daegu Symphony Orchestra, the Inchon Symphony Orchestra in Korea and Santa Ana Symphony, performing the concertos of Tchaikovsky, Brahms and Bruch. 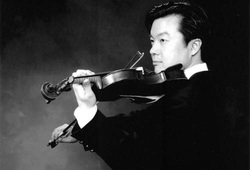 During the 2003-2004 season, Park soloed with the Utah Symphony and the Pyongyang State Orchestra of North Korea in a cultural exchange gala concert. In 2005, Park performed with the Salt Lake Symphony, and in the summer of 2006 Park held the position of concert master and was a faculty member at the Wintergreen Music Festival. Currently, Park is the Assistant Concertmaster of the Utah Symphony and an Adjunct Associate Professor of Music at the University of Utah. Prior to joining the Utah Symphony, Park was the Concertmaster of the Festival d’Art Lyrique de Musique d’Aix-en Provence, the Juilliard Symphony Orchestra and the Festival Orchestra of the Music Academy of the West. As a concertmaster, Park has worked with such musicians as Joseph Silverstein, Leonard Slatkin, John Williams, Robert Mann, Keith Lockhart and Reinhart Goeble of Antique Cologne. In his spare time, Park enjoys studying sports, arts and literature. In the spring of 2005, Park held the position of Distinguished Artist at the UC Santa Barbara.